This exercise will help you practice looking for multiple loops at work in a situation. This article reports on a slowdown in Starbucks' sales in the US. 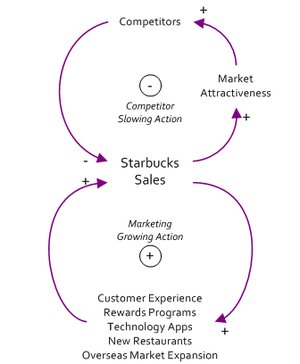 Your task is to draw a systemic structure with two loops: a reinforcing loop that is the motor of Starbucks' same-store sales growth and the balancing loop from new competition that has recently slowed growth. Hint: You can base your work on the Netflix illustration from the video. A suggested solution is provided in the references.